I've worked out a proper grand unified theory of story telling, and it's much simpler than all the old theories. There's a plot, and there's a story. The plot is just what happens: they do this then they do that. The action is in the plot. But the story, the real story is outside of the plot: it's about the changes to the character, it's about the struggle and the feelings and the emotions." There's the hero's journey, the quest. There's boy meets girl. There's tragedy, there's comedy." All stories are the same. A man falls in a hole. If he climbs out of the hole: it's a comedy. If he dies in the hole, it's a tragedy." Other people say stories are an evolved social memory aid, used for conveying meaningful and potentially life-saving knowledge. Some people say a story must have a message, and others disagree. I think a story's purpose is to entertain, and it does this by creating suspense. Stories work by setting up two quests, an important quest and an unimportant quest. A quest, or question, creates suspense in the mind of the viewer. The important quest is usually established first. The story is not over until the important quest is resolved. But: 90% of the story is about the unimportant quest. Here's an example, Wreck it Ralph. Soon after, Ralph establishes that his quest is to get a medal. This is the unimportant quest. 90% of the action will now be dedicated to the unimportant quest. It's all a ruse. It's all a magician's trick to distract from the real quest: stop being a loser Ralph! Along the way he forms a tenuous friendship: showing some progress on the important quest. But there's a conflict between the two quests. This is a universal constant. The inner quest (the unimportant quest) may appear to the character to be a way to resolve the outer quest (the important quest). In order to fulfill the unimportant quest of getting a medal, he betrays his only friend. Now he's further than ever from fulfilling the important quest. Even though he got his stupid, unimportant medal. This causes a crisis! He suddenly knows what's really important, and in real terms, the crisis leads to the possible destruction of everyone's world. Once he knows what's really important, the story must race to its conclusion quickly. There's some action as he races to simultaneously resolve the crisis (effectively: save the world) and to stop being a loser. Will he make it? Crisis averted! He makes a bunch of friends, fulfilling the important quest, and now the story is over. 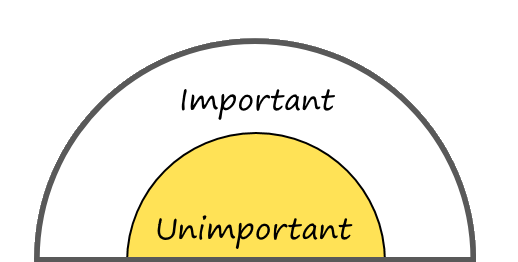 The "unimportant" quest is often a matter of life of death, so perhaps "unimportant" is not the right way to portray it. How about, "distracting". It's the distracting quest, that prevents them from immediately addressing the more fundamental pre-existing quest. Either: 1. by solving the obvious problem they become aware of the original problem and solve both. Or: 2. their attempt to solve the obvious problem reveals the real problem to them (through a crisis). They can now ignore the distraction and solve only the original problem.